The nursing home industry is adjusting to an aging population with needs for more specialized care by creating more facilities for people with memory problems, such as dementia and Alzheimer’s disease. Developers have built at least three senior-living communities in the Toledo area in the past two years with units specifically designed for people with cognitive impairments: The Lakes of Monclova in Maumee, the Browning Masonic Community in Waterville, and St. Clare Commons in Perrysburg. Two similar facilities are under construction: the Grove at Oakleaf Village in Sylvania Township and LanePark in Oregon. “Dementia is a catchall term we have for people who have memory problems,” said Cheryl Conley, program director for the Northwest Ohio chapter of the Alzheimer’s Association. She said Alzheimer’s is the most common type of dementia, but there are many others. An estimated 38,000 people have dementia in the 24-county area of northwest Ohio that the agency serves, Ms. Conley said. 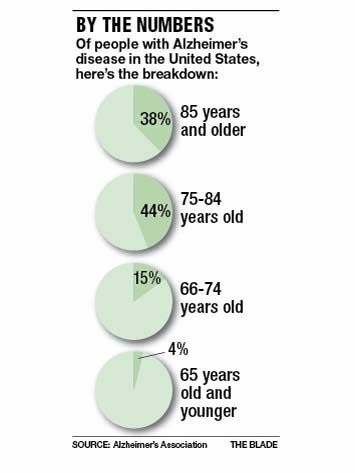 Nationally about 5.2 million Americans have Alzheimer’s disease and that number is expected to increase dramatically as Baby Boomers age over the next 30 years, said Nick Vargas, development and communications director for the association. “We still don’t know exactly why it happens. Age is definitely the biggest risk. It doubles every five years after age 65,” he said. “The trend is following the need,” said Jean Thompson, executive director of Ohio Assisted Living Association. Ms. Thompson said people who 15 years ago needed assisted living may now need a more protected and supervised environment. The new senior-living facilities being built in the Toledo area, such as St. Clare Commons in Perrysburg, are being designed with this in mind, said Carrie McGlothlin, regional director of marketing for Fransciscan Living Communities, which owns St. Clare and three other senior-care homes in the Toledo area. Ms. McGlothlin said the nursing home has a special, secure unit for people with advanced dementia. Getting in and out of the unit requires a key card. “Memory care — I feel it sums up what we are trying to accomplish. I heard in the past of other programs that called them dementia units and that sounds so institutional,” she said. The facility includes a 36-unit memory care area, along with an assisted-living area and a rehabilitation or skilled-nursing area. The company plans to add independent-living options, which will be more like apartments, so that as people get older and their needs change, they can stay in one place, Ms. McGlothlin said. The Grove at Oakleaf Village in Sylvania Township, which is to open in March or April, is following this design trend. The company operates 145 independent living and assisted-living units for about 155 residents at its facility on the Oakleaf Village campus on Holland-Sylavnia Road. The Grove will be a stand-alone, $6.3 million addition on the northwest side of the campus. It will have 40 units for up to 48 residents, said Todd Gabel, regional manager. The addition will be made up of four “neighborhoods” with 10 units for up to 12 residents in each. Each neighborhood will have small, homelike spaces to promote informal social contact. These will include a family room and dining room for activities and an open kitchen to create another familiar gathering space, he said. Wallick Communities, which operates a senior community in Columbus, said the Grove in Toledo is the company’s first facility with a specific building for patients with dementia. “Nursing homes that specialize in dementia care can have a major role in providing a wonderful quality of life,” Ms. Conley said. She added that every nursing home has a large percentage of residents with dementia, usually about 60 to 70 percent. “So we need all them to be dementia friendly whether you have a special unit or not,” she said. Ms. Conley said the Alzheimer’s Association has seen an increase in demand for its adult day center which offers a place for people with dementia to participate in programming during the week. “Most people who have it take to the couch, become passive and lose interest and don’t know how to fill their days,” she said. The adult day center provides respite for the family so they can go to work or to the store or just take a break, Ms. Conley said. For more information on dementia or for a referral for services contact the Northwest Ohio Alzheimer’s Association at 1-800-272-3900. It is at alz.org/​nwohio/ on the Web.